Shipyard Marine Projects Ltd. finished the partially equipped fishing vessel "Zephyr" (LK 394). The pelagic trawler, after being towed to Norway, will eventually be equipped in the Larsnes Mek. 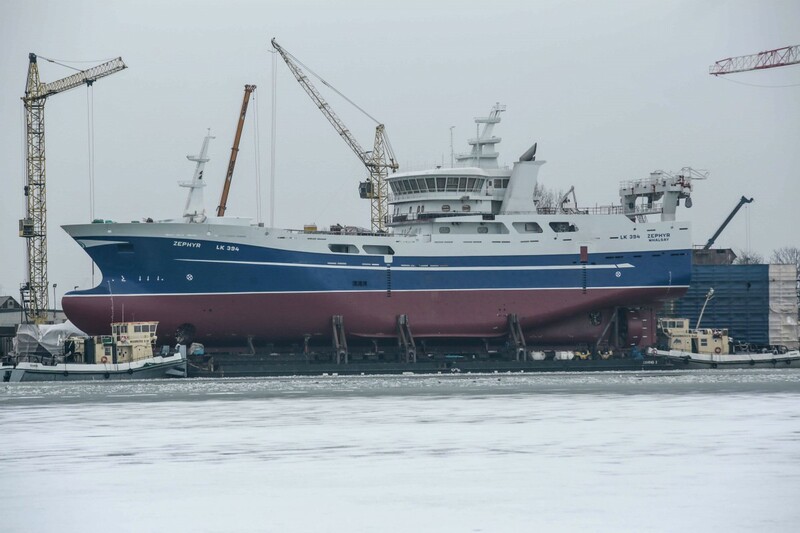 Verksted AS shipyard and transferred in the summer of 2019 to the British shipowner Zephyr Fishing Company Ltd..
On 31 January 2019, the ship was placed on the "Conrad 2" pontoon. The next day, both units left Marine Projects Ltd. shipyard and will be launched on February 4. After that last works will be carried out on the vessel, which will be then handed over to the client in mid-February. The trawler was built according to the Det norske Veritas (DNV / GL) regulations for the + 1A1, EO, and Fishing Vessel classes. It is the seventh ship built in cooperation with the Larsnes Mek. Verksted AS shipyard. The next fishing vessel for this client is already under construction.